Have a question on Tahoe? Tahoe is available in 10 different colors - Black, Red, Summit White, Blue, Pepper White Non Metallic, White Perlescent, Havanna Black Metallic, Silver Ice Metallic, Tungstan Metallic and Satin Steel Grey Metallic. Watch latest video reviews of Chevrolet Tahoe to know about its interiors, exteriors, performance, mileage and more. Chevrolet has been producing desirable passenger vehicles for more than a century, Chevrolet Tahoe being yet another sensational innovation by the elite American automakers. This imposing SUV is quite similar in looks to GMC Yukon, Chevy's own Suburban and has been in the Chevrolet line-up since the early 1990s. Over the years, Tahoe has been receiving an overwhelming response throughout the world and in 2014, Tahoe was ranked as the top affordable large SUV. Sturdy, dexterous and elegant, this SUV is offered in 2WD and 4WD drive option. 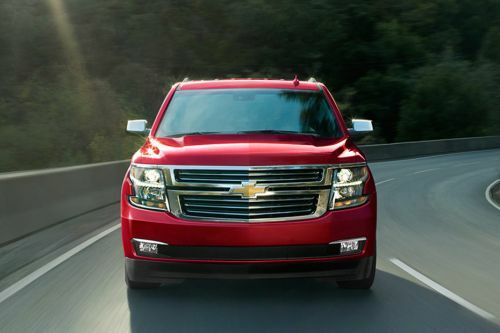 Chevrolet Tahoe is a versatile SUV packed with practical utility features necessary to make your journey comfortable and connected. You will have full access to infotainment segment via Chevrolet MyLink touchscreen, 10-speaker Bose centerpoint surround sound system, rear seat blu-ray entertainment system with 8-inch diagonal screen, steering wheel mounted Bluetooth wireless connectivity, 6 USB ports, navigation and more which are bound to elevate your driving experience. The upholstery & comfort seats make you feel you are commuting in an executive class flight laden with countless comfort & luxury features including 2682-litres of boot space, programmable power liftgate, fast folding rear seats, lockable storage, 15 cup holders, centre console with 12 charging locations, start/stop engine function and much more. This is not the end, you are definitely going to experience more with this exquisite SUV. This premium SUV is strong, bold and sturdy which is a result of its dimensions that across all the variants range between 4247-5182 mm x 2045 x 1890mm (L x W x H) and the wheelbase provided measures 2946 mm which makes this SUV quite spacious inside. The front facade featuring large radiator grille on the bumper, athletic stance and fog lamps is the centre of attraction which is bound to capture your gaze at the vehicle. Lighting package for this sturdy vehicle is appointed with projector beam headlamps and rear LED taillights. The car comes employed with alluring wheel design with size ranging from 18-inch alloy wheels to 22-inch chrome clad alloy wheels, depending upon the variant you choose. To deliver redefined power output and reduced fuel consumption, this exquisite SUV is packed with Ecotec3 5.3-litre V8, in-lined 8-cylinder engine that churns out maximum power output of 355 hp at 5600 rpm along with a peak torque of 518 Nm at 4100 rpm. The innovative sequential fuel injection system employed in the car keeps a check on the usage of fuel. The mileage of the car stands out to be 13.0 l/100km which is appreciable. Despite being an SUV, Tahoe picks up numbers quite swiftly and can dispatch 0-100 km/hr in mere 8 seconds clocking a top speed of 232 km/hr. Also, you have the option to select your favorite trim for this car available in two-wheel drive and four-wheel drive (2WD/4WD) – LS AT, LT AT and LTZ AT. For firm handling and braking, this optional 2WD/4WD full-size SUV comes packed with lighter suspension system employed with aluminum control arms and coil-over shock suspension. Exclusive front center airbags are provided for driver and passengers safety. Other driver assisted technologies packed in this car includes rear vision camera for easy maneuvering of the SUV. Rear cross traffic alert works using the radar sensors and also functions as Side Blind Zone Alert function. Other safety aspects laden in this car includes forward collision alert, adaptive cruise control, safety alert seat, lane change alert, crash imminent braking technology, StabiliTrak Electronic Stability Control System (ESC) and more. In short, it is a complete compact SUV package that assures you safety & protection for every ride you take irrespective of the surface you are going to travel. Chevrolet Tahoe is a very well-designed, strong-in-built SUV bestowed with high tech infotainment system, safety features and reliable braking-suspension system. The only problem you may face is its massive size due to which riding in tight spaces may become difficult and at the same time its similar looks to the Suburban diminishes the exclusive tag. What are the colors options available in Chevrolet Tahoe?